Kit preview of Armorcast's Mad cat. Click on each picture for a (much) larger view. The box with color reference photo. Missile rack, Lower Leg, Foot, and Arm Weapon Pod. Multi-piece Torso detail and test fit. NO glue or cleanup yet! Armorcast, previously known for their resin Warhammer 40K kits and gaming accessories, has just released the first kit in their Battletech line. 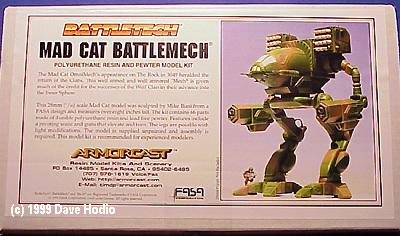 The Battletech Mad Cat Clan Omnimech is 1/60th scale (or to scale with 28mm gaming figures) making it a little over 8" tall. The kit, beautifully sculpted by Mike Biasi in resin and white metal, features moveable and posable options and closely follows FASA designs. Needless to say, my expectations were very high.. Inside the box, cushioned generously with packing peanuts, are several baggies of white resin and one of pewter. There are 28 resin parts and 40 metal parts. 30 of the 40 metal parts are missile tips to be inserted into the launchers. The first impression is that the finely detailed resin parts are very crisp with no visible air bubbles and that very little cleanup will be necessary. Just judging by weight, there is a lot of resin here. The resin parts are of the high quality, virtually odorless variety and have already had the pour trunks removed. Sanding down the remains of these attachment points will be the majority of the cleanup required. Aside from that you will only find some very fine mold line flash that I scraped away with a fingernail. A polishing stick will finish the job. Watch for some support "webbing", angles connecting surfaces that are part of the molding process. They look like the belong there but should be removed. The metal parts are of similarly high quality but removing all of the missile tips from their trees and sanding down the attachment point may prove a bit tedious. Fortunately, it looks like any cleanup will be hidden once the missiles are in the launcher. I expect that they will look great and another nice feature is that you can leave a few out to simulate missiles that have just been fired.. This appears to be a remarkably well engineered kit. Within 15 minutes of opening the box and with the help of an X-Acto knife, I was test fitting the 4 main torso pieces and marvelling at the fit. Hopefully the legs will prove as well designed. 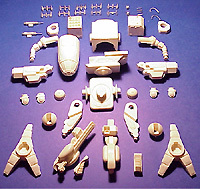 Major parts are keyed for position, movement,and disassembly for transport. 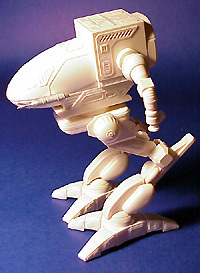 There are posability options to reposition the legs to a more dynamic or even running pose and to allow greater range of motion for the arms and weapons pods. I think that the options the builder chooses in modifying the basic pose will dictate the difficulty of the kit as it will require modifying specific parts. Radically messing with legs may induce some significant center of balance problems if not well thought out. This is unavoidable with a two legged mech. My first attempt will be the standard pose. At the moment, there is only a semi-hollow resin nose without a cockpit. While this was nearly unforgivable on Horizon's 1/35 Mad Cat, it doesn't detract much from this kit.t.. 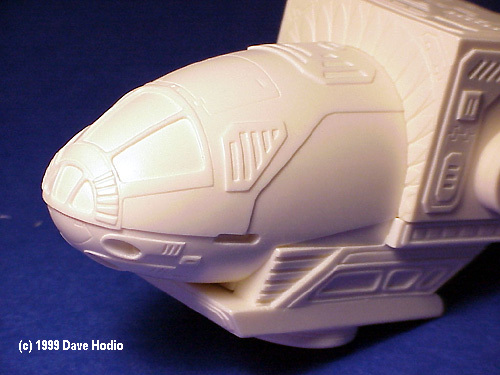 The instructions consist of a two-page construction paper and a separate one-sheet on generic resin modeling techniques. The instructions provide an introduction, an exploded view drawing, and a brief assembly sequence. The remainder of the instruction document suggests some of the possible options and how to accomplish them. 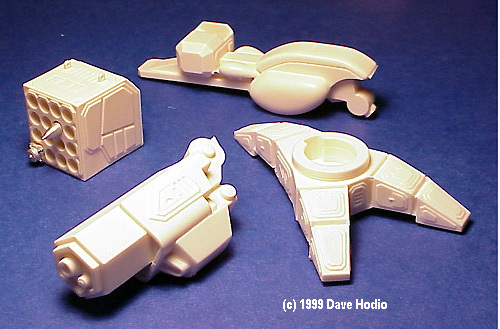 There are only a couple of black and white pictures of the completed model. Other than a recommended sequence, painting is totally left to the discretion of the builder. There are a lot of painting possibilities and some examples in the instructions would have been nice to give the builder a creative jump start. Although well written, the instructions do seem a bit sparse but are probably adequate since the kit is engineered so well and experienced modelers will have no problem. I have to be careful here not to let my bias for the subject matter color my review but I must say that I believe this is one of the finest resin kits I own. It compares favorably with my Fusion Models' Heavy Gear Kodiak. As for accuracy, I have a wealth of Battletech reference material and it looks near perfect to me. It was supposedly designed from the published game blueprints and some other multiview drawings.The only concessions made were to translate the 2D representation to a 3D one that wouldn't fall over. However, there have been many artist's interpretations of this mech over the years that all differ slightly so, in this regard, accuracy could be somewhat subjective. Hopefully, Armorcast or someone will provide some interesting decals for this line. I am already looking forward to the next mech in the series. Read an article on superdetailing the Mad Cat here. Last updated on 20 June 2002.